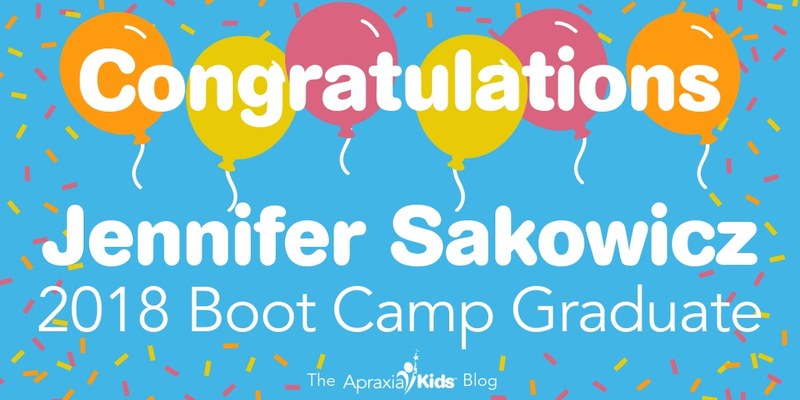 Congratulations to Jennifer Sakowicz, M.S., CCC-SLP, for graduating from the Apraxia Kids Intensive Training Institute (Apraxia Boot Camp)! Jennifer has worked in the field of speech-language pathology as both a speech-language pathologist and speech-language assistant since 2004. She received her Master’s Degree in Communication Disorders from Southern Connecticut State University. Jennifer has a variety of experience working with a diverse population of clients within the public school, private school, medical and clinical settings. Her clinical experience includes evaluation and treatment of speech and language disorders which include articulation, phonology, childhood apraxia of speech, receptive and expressive language, pragmatic language, augmentative and alternative communication, stuttering, voice, and language-based reading and writing impairments. She has also gained valuable experience working with children on the autism spectrum and with Down syndrome. Jennifer holds a special interest in childhood apraxia of speech (CAS), social cognitive impairments, and language-based literacy disorders. She published a thesis on the involvement of the school-based speech-language pathologist with students who have writing difficulties. Jennifer: Wow- what a hard question! If I had to pick the #1 thing I learned from this training experience, it would be how to properly conduct and analyze results of a motor speech assessment. Prior to the training, I was incorporating bits and pieces of what I knew about motor speech assessments into my evaluations, but wasn’t looking deeply enough into the motor speech system to best analyze the results and properly plan treatment. Jennifer: The relationships formed via this experience have been invaluable. I now feel that I have a “support group” to lean on for all things CAS. Apraxia Kids: Have you served as a local resource/information source for other professionals and families since attending the intensive training? If so, please share an example of how you used your expertise. Jennifer: Since the training, I have taken on the role of the Greater Hartford Walk Coordinator for Apraxia Kids. I have also fielded more inquiries about evaluations and treatment for children with CAS. In addition, I trained the employee at my practice, Karli Callahan, to evaluate and treat children with CAS. She just recently passed the assessment on the Apraxia Kids website and will be listed as an SLP. Lastly, I have continued the “apraxia play groups” at my office so that families and children with CAS can come together in a safe and supportive environment. Jennifer: I would say that boot camp is an invaluable experience that has greatly impacted my practice as an SLP. This opportunity challenged my critical thinking, problem-solving and overall knowledge in the areas of CAS. I am now a better SLP because of boot camp. I’ve also made life-long connections to other SLPs in the CAS community which is amazing. I would recommend this training without reservation and encourage all SLPs to apply! I wish more trainings were modeled like this one.